I follow the blog of photographer Leanne Cole. In fact, I’ve just been a guest blogger on her site, writing about SEO (search engine optimization) for photographers, though the article is helpful to anyone with a blog or website. The post appeared in Leanne’s Up For Discussion series in two parts, Part 1 and Part 2. Leanne has posted the photo above in a recent post. She challenged her readers to write a piece inspired by the image. 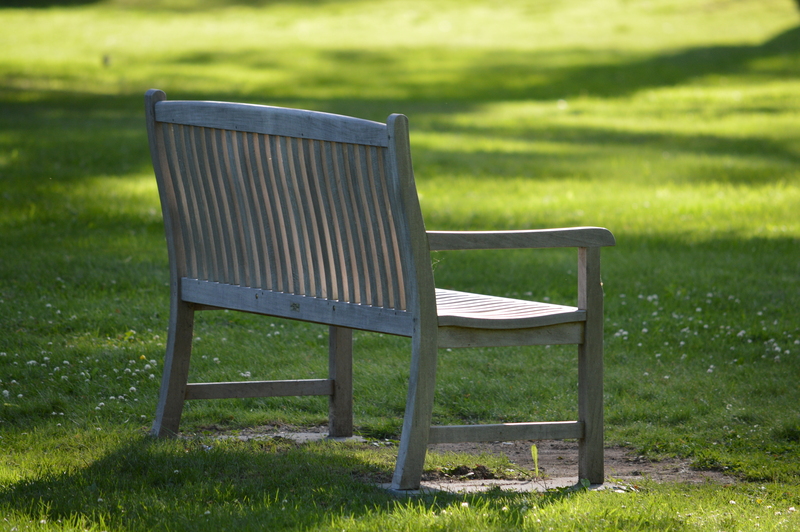 I can’t see a park bench without remembering “the park bench scene” I wrote for Love’s Compass, my first novella. In fact, just this past weekend I was snapping shots of a park bench that reminded me of the scene. Here’s the park bench photo I took in the late afternoon sun. 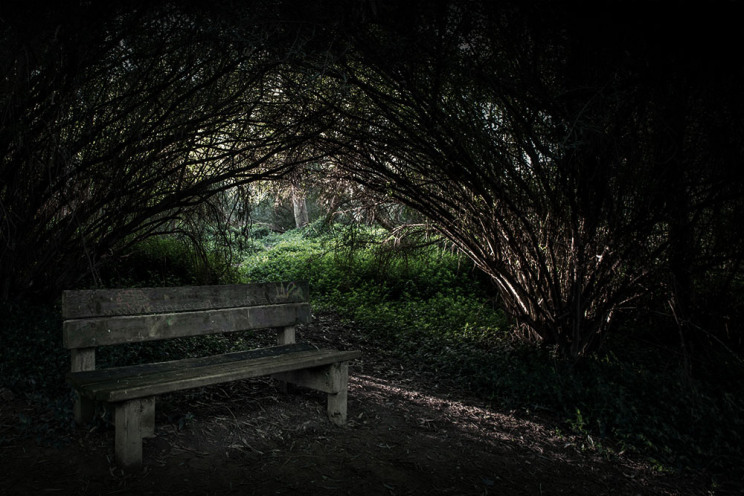 In my mind, I see Liv and Orin, the two main characters in Love’s Compass, sitting here. While Leanne asked for her readers to create a written piece inspired by her photo, I think it’s okay that I share something I wrote several years ago. So, from my novella, Love’s Compass, here’s the park bench scene. Note: each chapter of this book begins with a plant name and the meaning associated with the plant. These are thematic to the chapter they precede. Mid-morning on Tuesday, as Liv worked at her desk, a courier envelope arrived addressed to her. She opened it and found a handwritten letter from Orin. He said that although he was absorbing himself in his new venture in art, she was always in his thoughts. He apologized for the angst he caused her. And he asked if she might talk with him during the early evening on Friday. He suggested that if it were alright with her, they meet at a bench in a park near her office. She emailed him her reply that, yes, she would meet him. After the workday on Friday, they sat in the comfort of the sun, glad that it held back the slight chill of the late August evening. They did not move from the locations in which they had each positioned themselves – some three feet apart. “No, I’m not okay and I miss you, too. And I’m feeling pretty lost and alone and indecisive, and well…morally corrupt. This business of falling in love while married to someone else, despite it being a most imperfect marriage, just isn’t comfortable for me,” Liv replied. The ‘morally corrupt’ phrase was a truth, but she said it with a mild attempt at humor over her despondency. While she had not looked at him as she said the words, she gave him a side-glance when she finished. His eyes were on her and she could see grief in his face. He said nothing, and turning away he gazed across the park. As she ﬁnished this thought, Orin’s eyes looked into his lap and he watched his ﬁngers busily twirl an errant thread on his shirt. His downcast demeanor summarized the sorrow between them. Saying nothing, he looked over at her and offered his hand, midway across the bench. She took it, knowing that this was his acknowledgement and acceptance of what she had said. And there they sat in silence, as the people around them gave off the exuberance of freedom that comes with the arrival of the weekend. Again, she was amazed at the coldhearted way the world kept turning despite sadness in its midst. In time, he found his voice, though he was only able to comment on the activity of the sights before them, such as the puppy-like wrestling of two young boys, each with the objective to overpower the other, while having no intent to hurt each other. With a little smile he commented that the scene reminded him of his brother and himself at the same age. After sharing further observations, he wound his way to a comment on the weather. It was apparent to them both that he could not ﬁnd words to express any more of what was in his heart than what he had expressed the week before. Instead, he asked if she would want to meet again, at the bench, the following Friday. She said that would be ﬁne and then, still holding her hand, he walked her to her bus stop as the sun began its descent. If you’re interested in reading more of this story about love, marriage, family and divorcee, visit the the Love’s Compass page on this site. Love’s Compass is a great beach read. At less that 150 pages, you can enjoy a satisfying story in an afternoon. You’ll find reviews at Amazon where Love’s Compass is available in hardcover, paper back and for your Kindle.